I’m normally not a political person at all. I truly attempt to stay out of the chaotic political arena and simply do my best to, “Be the Change,” as Gandhi said so wisely many years ago. However, it’s been very difficult to escape this current election. It amazes me to see what our country has come to about elections and political campaigns. The insanity that is taking place and the encouragement of child like behaviors on behalf of both of the major candidates sickens me and causes me to worry about the state of our country and the world as a whole. The pure narcissism that is being unleashed along with the infantile characteristic frightens me to say the least, because in the end one of these individuals is chosen to lead our nation. Just writing that right now sends chills down my spine. One of these people are going to have nuclear powers at their fingertips. Today they are engaging in tantrums and participating in a blame contest and tomorrow they have the ability to wage war. If that isn’t scary I don’t know what is. The state of this election demonstrates why we are facing the issues we are facing in the world now. I must admit though I have curiously tuned into some televised debates, not because I am pulling for a specific candidate, but simply because this whole situation from the start has entertained and almost like a reality television program. I can only imagine what other nations are thinking about this travesty. Despite what is going on and the negative feelings I have about the whole process, I have to continue to believe that peace will prevail. I find myself repeating my personal mantra much more when engaging in any activity associated with the election and the state of our politics and ultimately the state of the world. My personal mantra, OM Shanti translates basically as Universal Peace, which I focus on throughout the day as a communication with the universe and my genuine being. So let me get down to the purpose of this article. 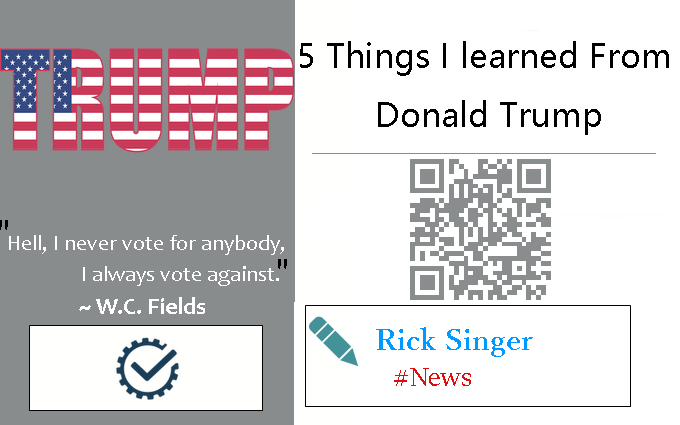 Through my observation of this current election I have come to notice 5 things that we can all learn from Donald Trump, clearly the most popular candidate. Again, I want you to know that I don’t like one candidate any more than the other and will not be voting because there’s no one involved that I would want to be the president of our great country. I have simply watched and kind of assessed “The Donald” and realized that I would not want to be him or for that matter have any of his most observable characteristics. So let’s get to this list and my hope is that you gain some insight and possibly learn and grow from my observations. I’m sure most of us realize this by now in our lives, however Donald has made me realize this much more. He can obviously do and buy anything he desires and he certainly is not a happy fellow. We can easily assess this by his demeanor and how he treats others. A saying comes to my mind, “Hurt people hurt people.” Basically if we are happy we inspire joy and happiness in others, however I think it’s pretty obvious by watching him that he is a damaged person and has possibly caused much damage in his life. Of course he can talk very well, but if you look beneath the talk you don’t see happiness. Verbal communication is only a very small percent of our communication and his nonverbal communication tells the story. It is easily recognized that Mr. Trump cannot get enough control. His domineering style and lack of respect for people shows us outright that his ego is in control. He controls many businesses, which is clearly not enough for him. He must seek control of a whole nation. His controlling nature frightens me especially the impulsivity of it all. He is quick to become enraged, get loud, and make threats when he believes he’s losing control. His talk about war and human beings as chess pieces is genuinely egoic behavior with a strong wanting to control everything around him. Nothing will be enough for this enormous ego. Unfortunately, control is a very illusive thing and if we tune into reality we know that control is an impossibility. However, for the ego the delusion of control is relentlessly pursued to the end. Never enough, never-ending, and never at peace. Let’s learn from this and let go of the delusional idea of control in our lives. If you look in the American Psychological Diagnostical Manual of Mental Disorders I am pretty sure there is a picture of Mr. Donald. Narcissism is how we would formally define Mr. Trump’s personality. In his mind he believes he is above all and really doesn’t have to behave according to society’s standards. I’m sure many will agree that this is not a nice picture of a human being. Narcissism is probably one of the most relevant diagnoses in the political arena. Donald may not be a “politician” but he certainly fits in. I believe that he truly thinks he can make all his unrealistic goals a reality because he is of course super human. One of our greatest educational experiences that Donald Trump leaves us with is that we must recognize our humanity and connection to others as well as the necessity to practice humility. I think it is minimizing Trump’s behavior by labeling it childish. My children actually have never even come close to the immature behavior that he exhibits. The blaming, name calling, pouting, and adult tantrums have amazed me and frightened me at the same time. This behavior has gotten him major publicity and maybe even a lot of votes, however to act like this and lead a country or actually lead in the leadership sense at all is impossible. Leaders are mature, genuine, respectable, realistic, inspiring and humble. Personally I don’t see Donald trump possessing any of these characteristics. Well, you may say how can he be so successful? You got me there! However, I’m not sure he is successful as much as maybe lucky or fortunate to have a good team behind him due to the money he does have. On the other hand, he’s about as successful as the banks that had to be bailed out of bankruptcy or our deeply in debt government. If that’s success I don’t want it and if he’s a leader I don’t want to be one. Donald Trump is not a president and I think it would benefit our country to recognize this sooner than later. We have recognized his lies, hypocrisy, manipulation and all the other wonderful characteristics mentioned above, so about now we should be saying okay jokes over Donald we know you were just messing with us. This all must be a publicity stunt. We must eventually realize in life that we have a purpose and place in this universal puzzle. When we discover this, we do everything we can to pursue this passion and stay out of where we don’t belong. Success comes when we align with our destined path. This is not Donald’s destined path nor our great nation’s destined path. Please let me wake up and realize it was all a bad nightmare. I really hope you were able to extrapolate some educational principles pertaining to your life from my rambling. I guess I just needed to express these things to clear my soul and express what I learned from this really strange election year. If you got anything out of it maybe you could do your best to not live like Donald Trump. As for my association with politics, I believe I am going to steer clear of it all again until we represent all people and every human being in this country has an equal chance to be president despite how much money they have. And perhaps we can put some type of cap on the amount of money that is spent on a campaign. This money could have certainly been used to feed, house, and educate human beings that have close to nothing. I will go back to my calm and serene daily life where I continue to “Be the Change,” which is my correct place in this world. Well, maybe before that, I’ll get to writing my list of learning experiences that I received from Hillary Clinton because this short discussion is by no means supportive of Mrs. Clinton.